I know, I know, November is two-thirds over already. It's snowing outside at the moment. But here's a look back at October. 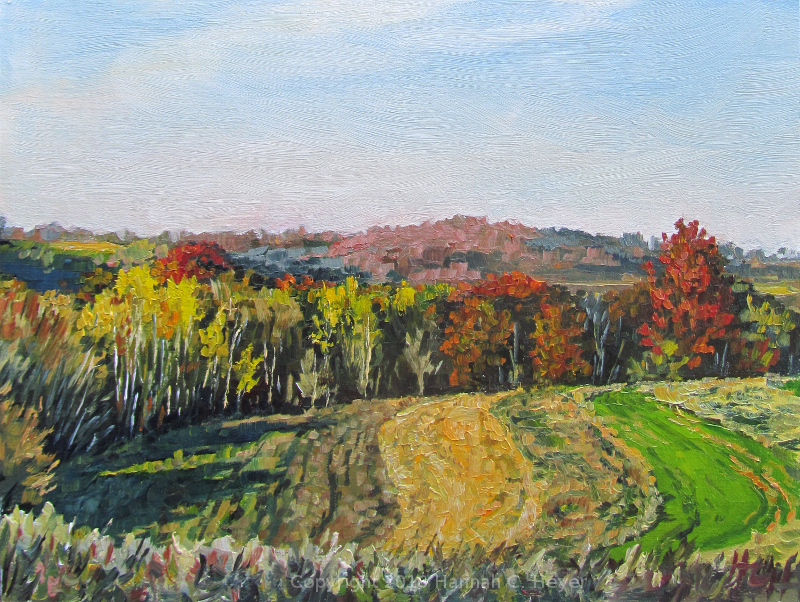 October 1st I met up with a great group of artists at Evansen Art Studio in Hastings, Minnesota to spend a day painting. In the evening the show was hung and there was a public reception. 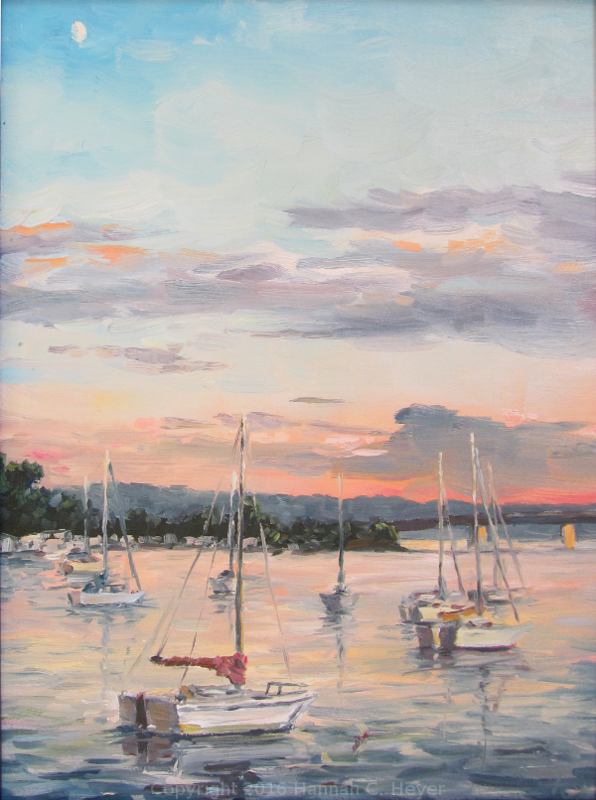 There were sure a lot of beautiful paintings and some of the them were featured in a silent auction at the Hastings Prescott Area Arts Council gala on November 4th. Another Season, 9 x 12" plein air oil on linen/hardboard. Fruit on the Vine, 12 x 9" plein air oil on linen/hardboard. 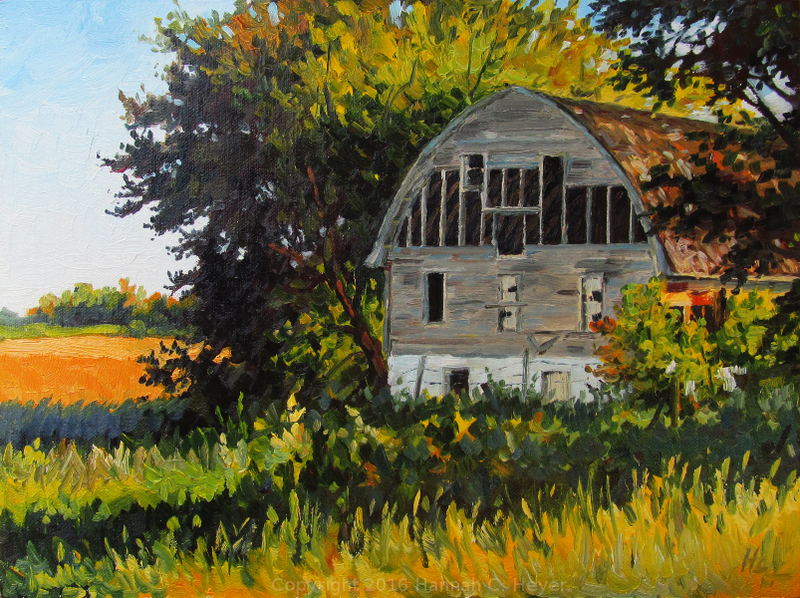 As the daylight hours became fewer, I didn't often get out to paint, or have long to work when I did. But I just love the light and color of this time of year, so it was good to get out and soak it in. 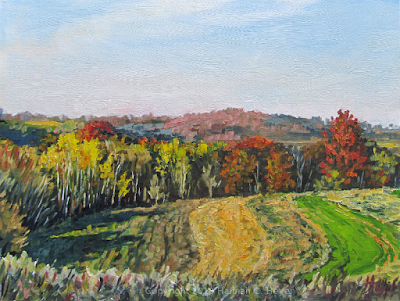 This is a smaller painting, so I could try to capture those gorgeous lines and colors in a short time before sunset on October 17th. 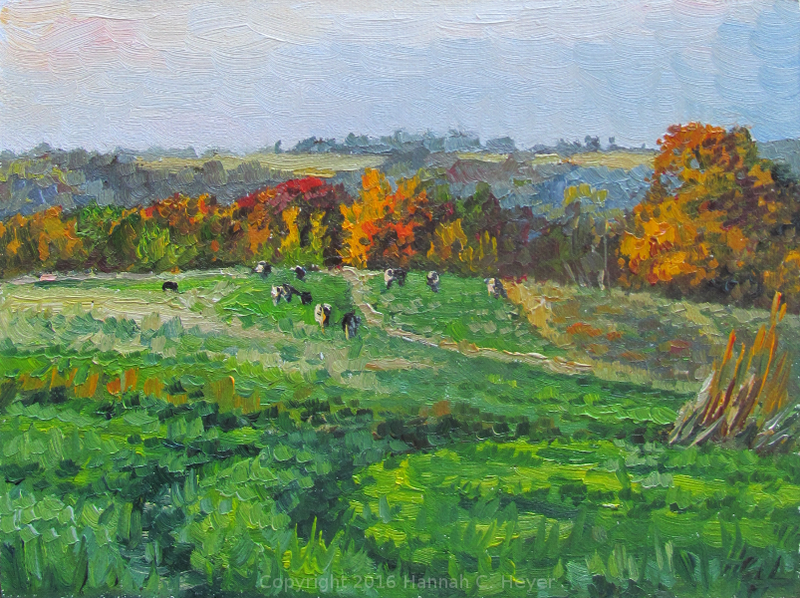 Pastures in October, 6 x 8" plein air oil on linen/hardboard. 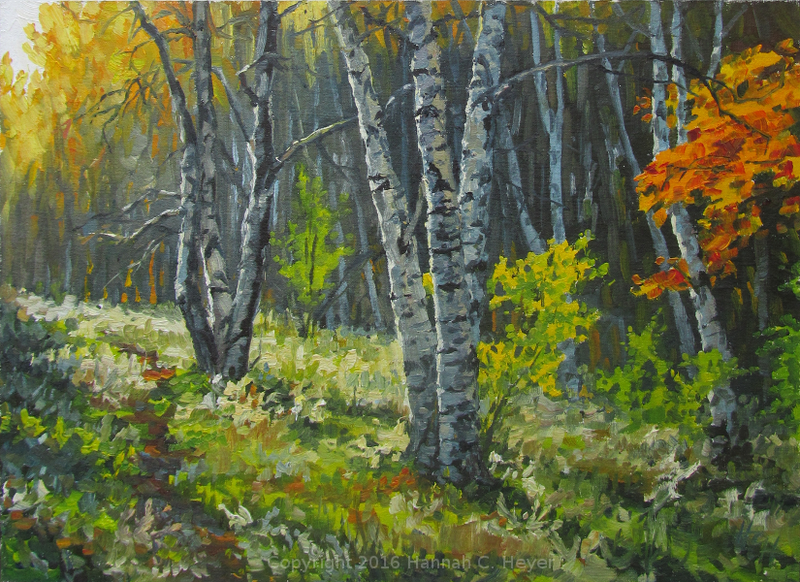 October 22: Time to get out into the woods. These back-lit birch trees caught my eye, with the golden poplars in the background, and all the wild asters that had gone to seed lit up with the low sun. Some cattle broke through a fence somewhere and came up behind me and stared. They weren't impressed. 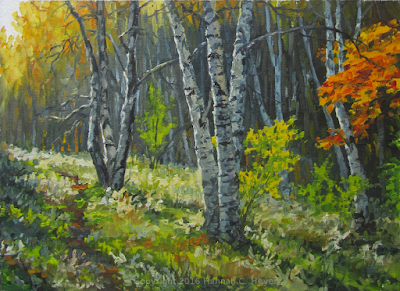 Birch Grove - Late Afternoon, 9 x 12"plein air oil on linen/birch panel. October 24: Another race against the sunset! I never tire of those curving fields with their varying colors and textures. Many of the trees in the woods had already lost their leaves, but the aspens and oaks still were a sight to behold with their vibrant yellows and rusty reds. 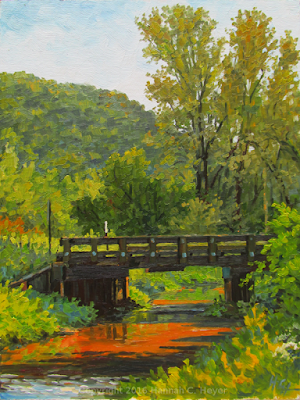 Late October Color, 9 x 12" plein air oil on linen/birch panel. I've only been out once so far this month, on November 4th. I painted quickly, as the light and shadows changed as the sun sank down beyond the neighboring bluffs, and the girl tending the fire didn't hold still. But it was one of those clear-sky days, with the smell of fallen leaves, and perfect for a little campfire supper. 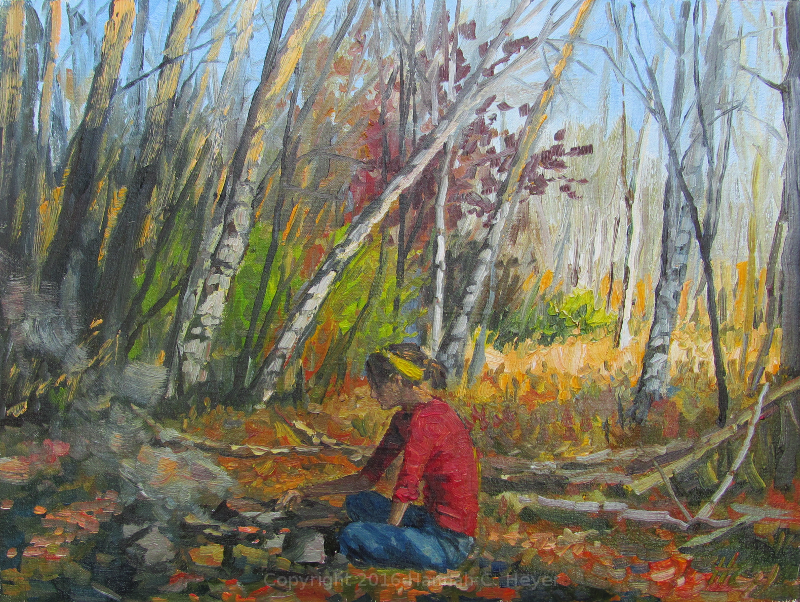 November Campfire, 9 x 12" plein air oil on linen/birch panel. September. A very full month. My sister, nephews and eldest niece were visiting from the other side of the world, and the time was precious. A lot was packed in, as we have to make the most of the time together, and the days flew by. I was also preparing for the Driftless Area Art Festival, which took place the 17th and 18th. Two beautiful days, among many rainy ones. (The following weekend the park was under water!) But that weekend was beautiful, and I thank all of you who came out and enjoyed it and made it a great event. 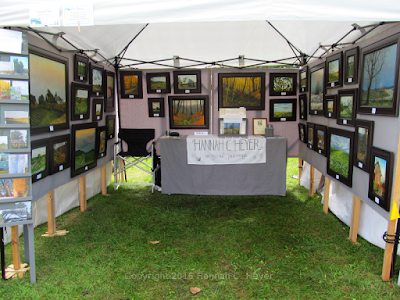 My temporary gallery: my booth at the Driftless Festival. At the same time, the Between the Bluffs plein air event was taking place in La Crosse, Wisconsin. 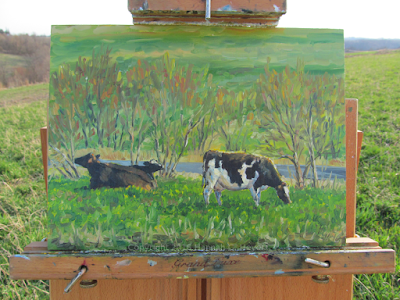 Since I didn't have a chance to paint the first week, I put in as much easel-time as I could the last few days. 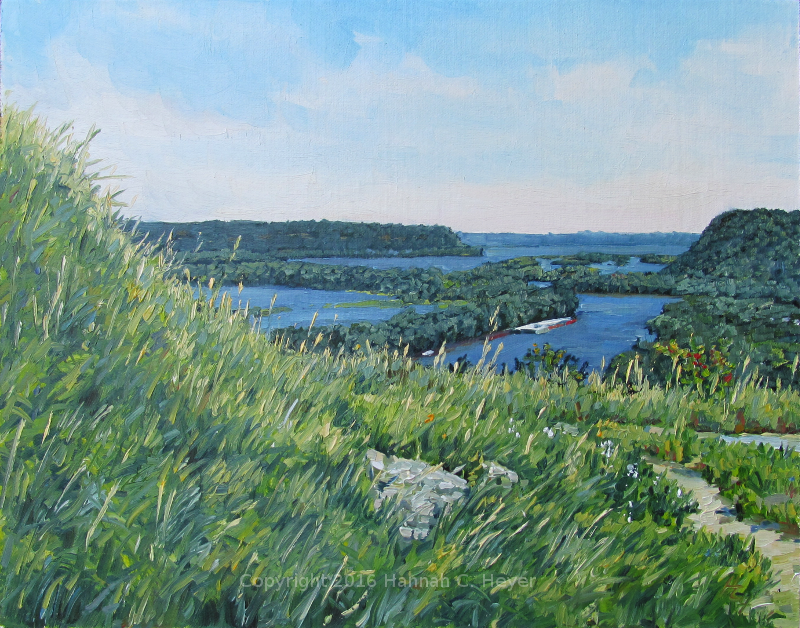 The first day, Monday, I painted on the very edge of the designated area, a view of the King's and Queen's Bluffs in Minnesota. They're such recognizable figures, and I always like how the light hits them, as they tower above the highway below. 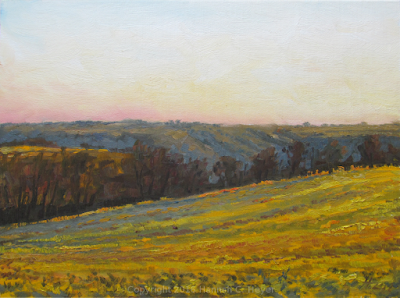 Driftless Royalty, 9 x 12 inch, plein air oil on linen/hardboard. It was a day to paint bluffs and clouds. 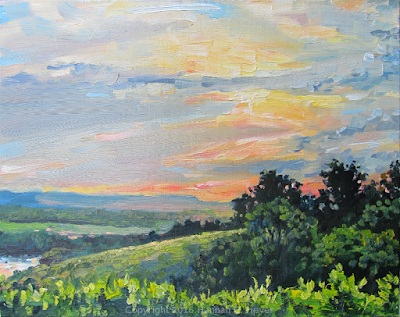 I tried for another quick paint before dark, watching a distant storm in the sky and painting a valley below. 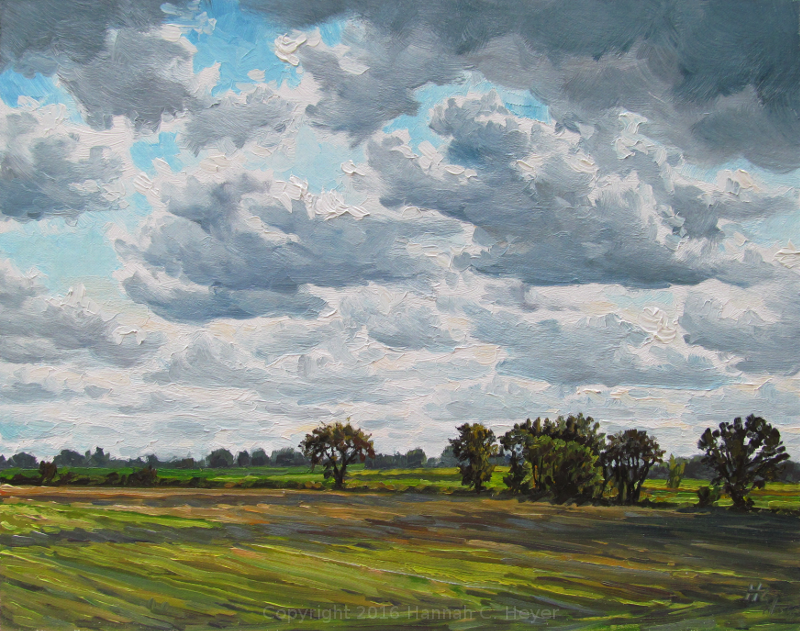 Distant Storm Clouds, 9 x 12 inch, plein air oil on linen/hardboard. On Tuesday I headed for a county road along the Interstate, to paint a barn I've long admired. That cupola! It's a beauty. 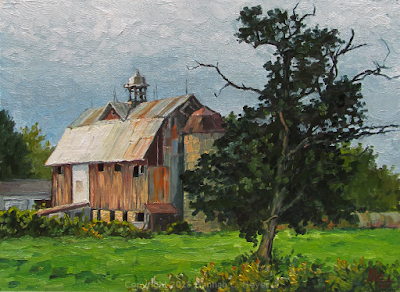 The sky was dark to the south and west, which contrasted beautifully with the light on the roof of the barn and the dark outline of a tree in the pasture. The weather moved in, and I got rained on a little before the skies cleared. Local Color, 9 x 12 inch, oil on linen/hardboard. Then it was time to paint more clouds and valleys! A friend joined me and we went to the upper Hixon trails in La Crosse. The shadows were long, the light fleeting, the mosquitoes voracious. 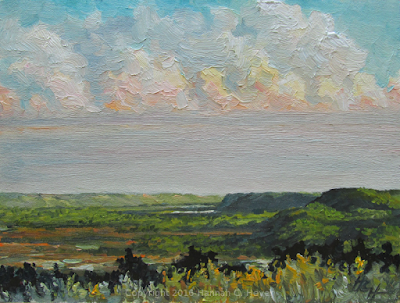 Cloud-Watching, Upper Hixon Trails; 9 x 12 inch, plein air oil on linen/hardboard. Wednesday brought more wet weather, but it cleared for a short time in the afternoon. The creek was swollen and brown with all the rain. 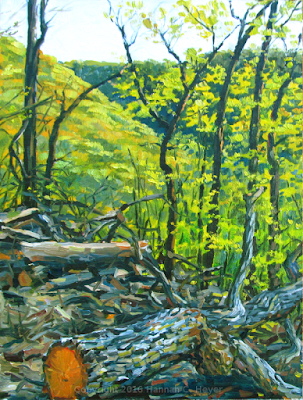 I painted the light and shadows quickly, and the sky was already cloudy again as I finished up. 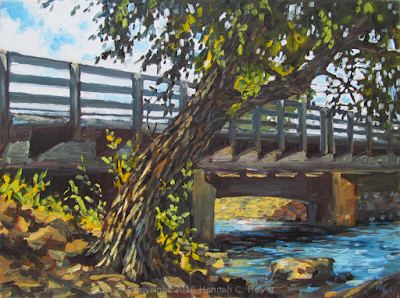 Bridge over Muddy Water, 12 x 9 inch, plein air oil on linen/hardboard. My three in the show! 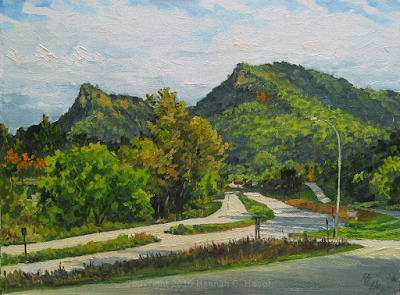 Saturday morning was the "quick paint" in La Crosse. I almost didn't make it. I left home "early", but not early enough, as unbeknownst to me there was a color run happening downtown, and parking where I thought I was going to park was not an option. I was also not quite sure where I was supposed to be, and I wasn't so sure about braving the clouds of colored dust, so wandered around lugging my gear for awhile until I finally stumbled into the right place. Whew! 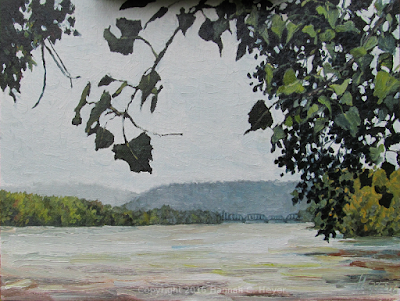 Though I had to paint quickly, it was a relaxing place to be: watching the poplar leaves blow in the wind and the river rush by. 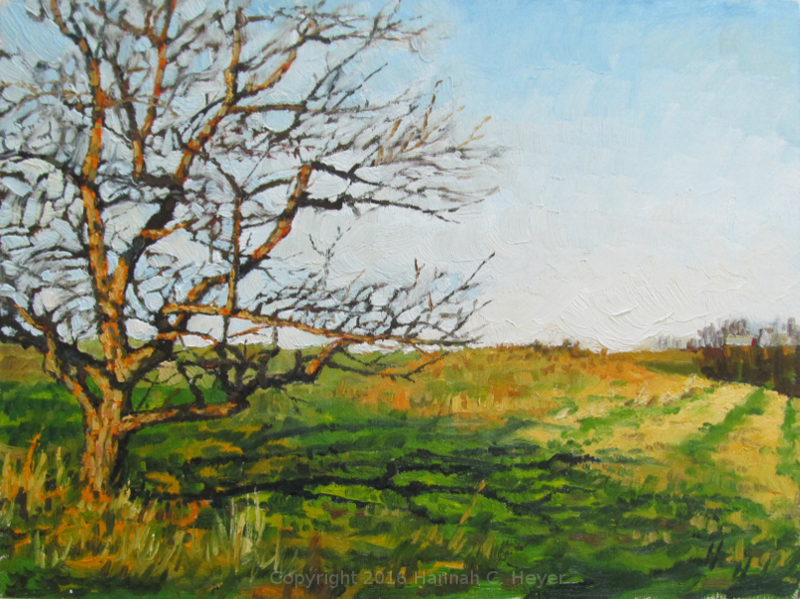 My quick-paint, 9 x 12 inch, plein air oil on linen/hardboard. Saturday night was the public reception. Always fun to see all the new paintings from around the area! 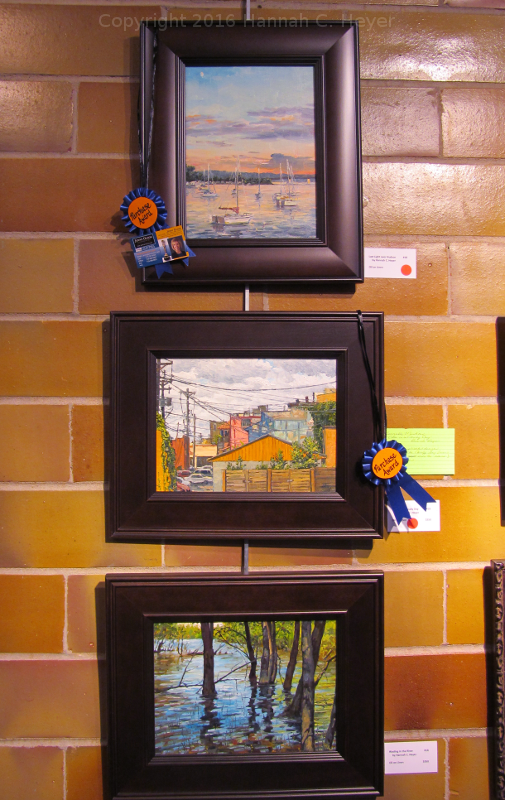 I was so pleased to receive an Award of Excellence for my painting "Local Color", and I also won first place for my quick-paint. Two of my paintings are going to new homes, which is the best honor of all. Thank you to everyone who came! Detroit, Michigan, four years after my first time there. It was a visit to see family, and it was so good to get a glimpse into their projects and lives. Though it wasn't a painting trip, I brought my gear along just in case, and got this one in on the top of the Jam Handy Building on the evening of August 25th. 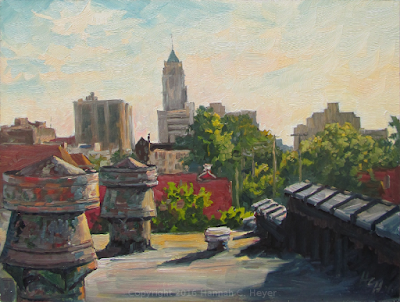 Evening on the Rooftop, 11 x 14 inch plein air, oil on linen/hardboard. The first day, Friday, started out cloudy. 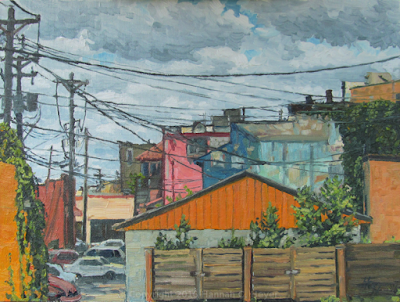 I was drawn to a spot just behind the gallery, the view through an alley with a mass of power lines overhead, and a colorful collection of buildings. Color on a Cloudy Day, 9 x 12 inch, plein air, oil on linen/hardboard. 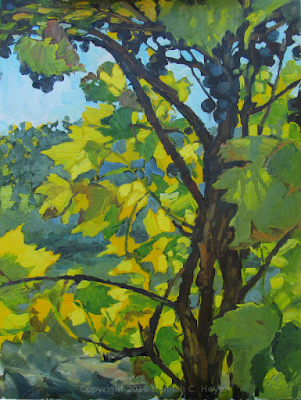 The sun shone a few times during that first painting - and it was hot! But it always clouded up again, and began to rain off and on later while I did this painting of a collection of old sheds and a great old tree, with a mass of weeds and wildflowers in the foreground. I was cold and wet when I finished, but the sky was just beginning to clear and show some color as the sun set. 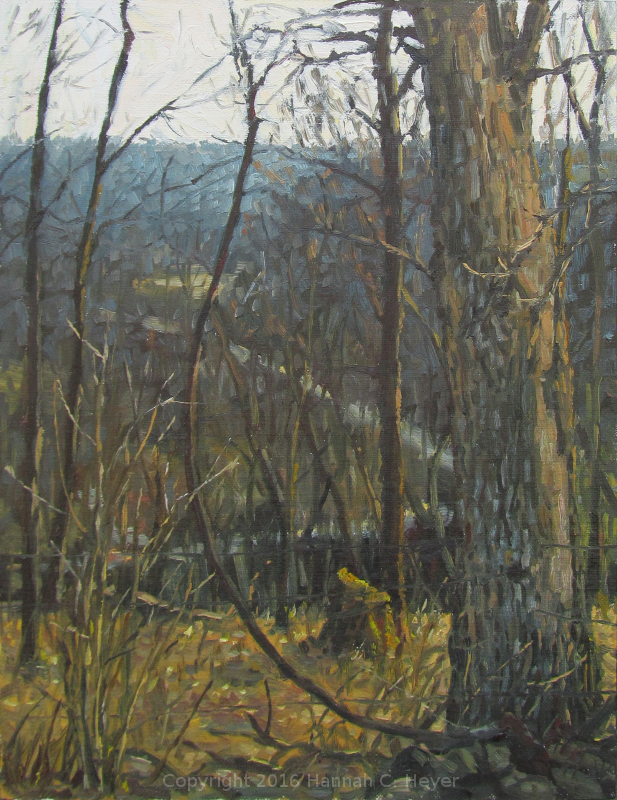 River Road Relic, 9 x 12 inch, plein air, oil on linen/hardboard. Saturday morning was busy in downtown Hudson, and I discovered that parking spaces were a rare find! I did a little more exploring before finding a spot pretty far from the river. I walked down and found a place in the shade to paint. This used to be a toll road across the St. Croix River, but now is part of Lakefront Park, a good place to walk and watch the boats, do some fishing, enjoy the sunshine. I finished just in time to refuel with a burger and fries and some good company, catching up with a group of some of the other artists. 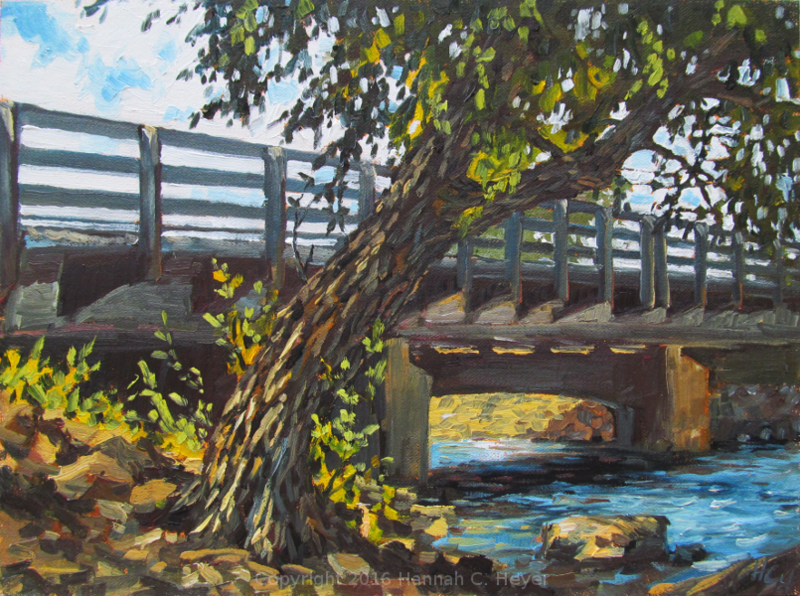 Willow by the Bridge, 9 x 12 inch, plein air, oil on linen/hardboard. I went exploring in the afternoon, looking for some countryside, and a good place to watch the clouds. I...don't even know where this is. I went up and down so many roads, and I got pretty mixed up. But I liked this spot, wherever it was, with its line of trees between fields and the cloud shadows moving over the landscape. 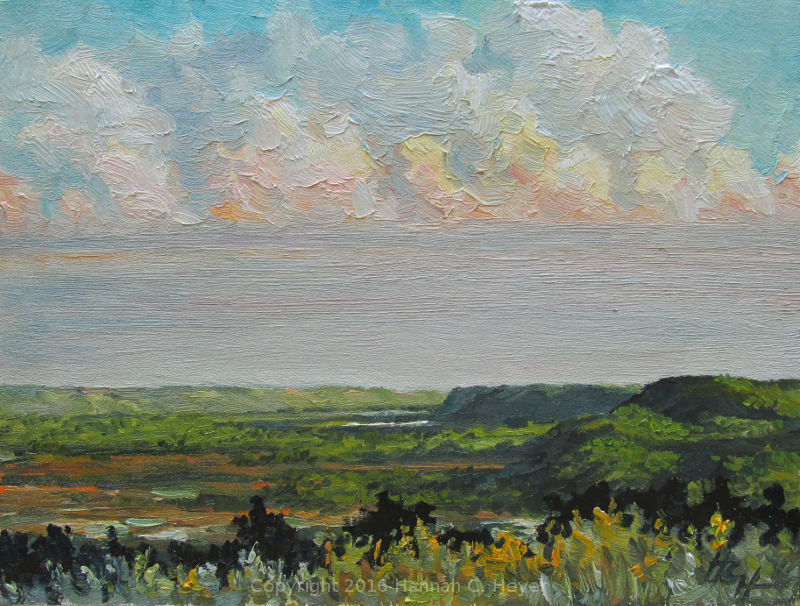 Partly-Cloudy, 11 x 14 inch, plein air, oil on linen/hardboard. It took some time, but I did find my way back to Hudson, where I was happy to get to hang out for a bit with another group of artists, and eat some delicious bruschetta at Bricks - so good! 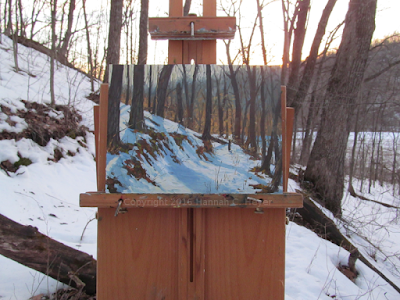 Last Light over Hudson, 12 x 9 inch, plein air, oil on linen/hardboard. The river was a busy place Sunday, with a lot of people out enjoying the sunshine and water. The sounds of it were all around me as I painted this one, watching the reflections dance, in a cool, shady spot near a swimming beach. 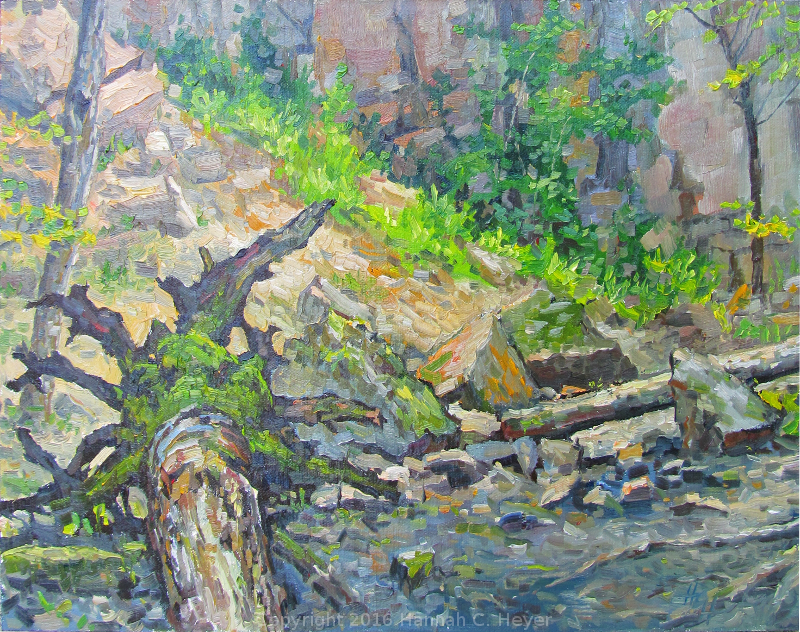 Wading in the River, 9 x 12 inch, plein air, oil on linen/hardboard. I did some painting in the evening too, and then it was time to do some framing, and get some much-needed sleep. 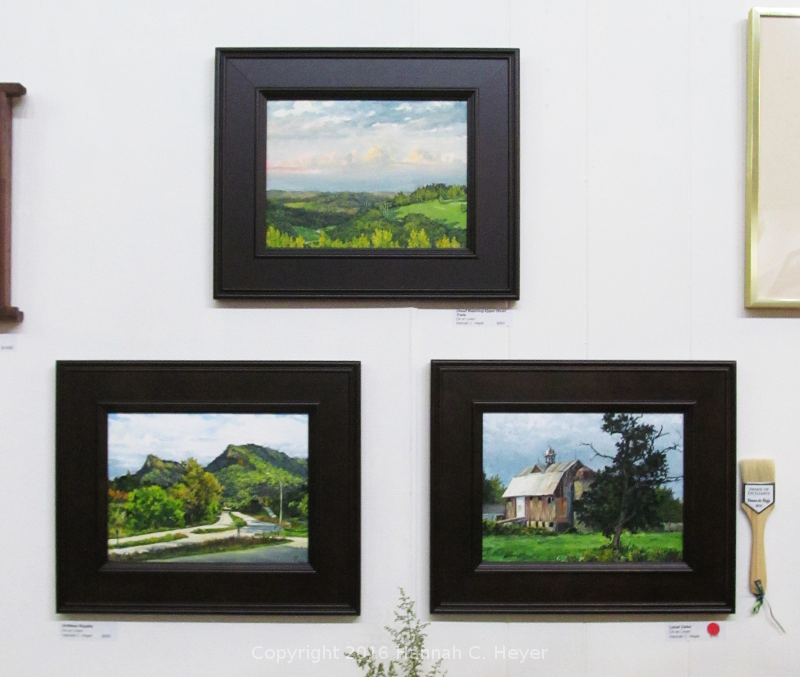 Monday was the day for hanging the show, and we each prepared and brought in three paintings. Then the gallery folks did their magic. Meanwhile, I did some more painting, and then explored downtown with some loved-ones, who traveled to see me and attend the opening. We did a little shopping, hunted out a bunch of Little Free Libraries (Hudson is where they began), and ate more bruschetta. The opening reception was in the evening, and it was lovely. So fun to see where everyone painted, and the beautiful art created, hear some stories, and chat with some people met during the week. 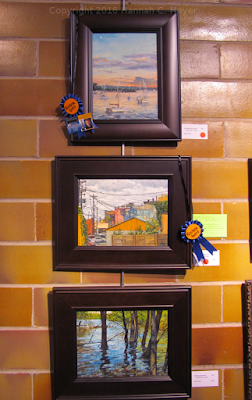 I was so happy to also receive an Honorable Mention for my painting "Color on a Cloudy Day"! The show will be up till August 28, 2016 - check it out! Explore Hudson! Find a Little Free Libary! Eat bruschetta! 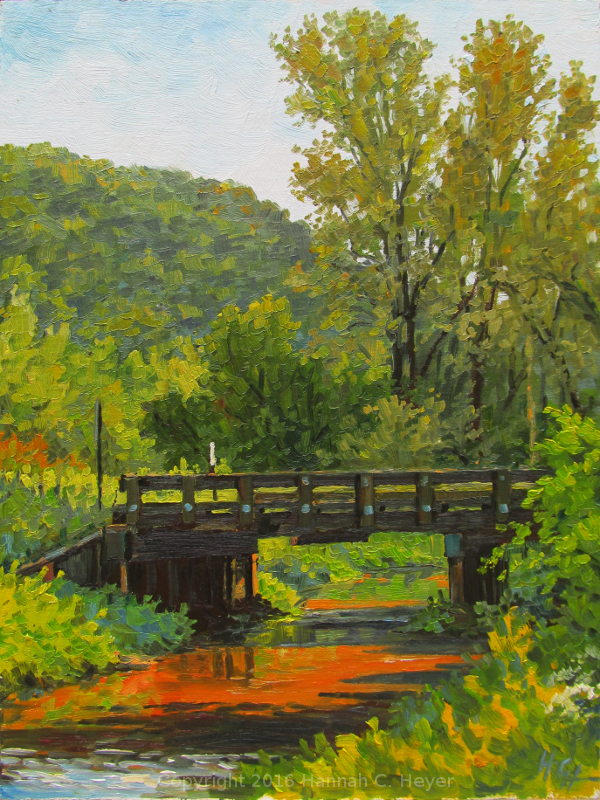 June 20-25 - time once again for the Red Wing plein air festival! This was my 6th year participating. Every year brings a chance to get to know the Red Wing area a little better. I found some new (to me) places this year, and revisited old ones. My first painting of the week was on a farm that I'd admired and painted from a short distance away a few years ago. This time I got a closer look, and painted from another angle. It's such a beautiful place. 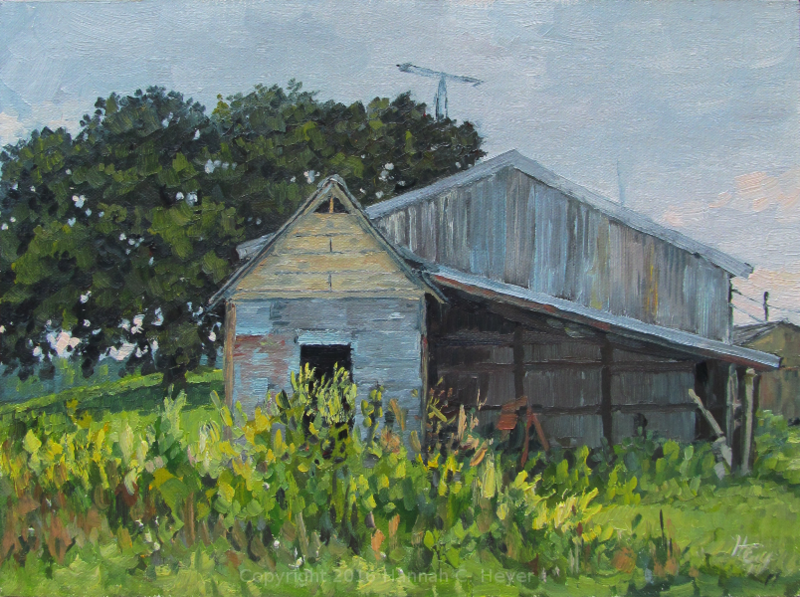 The bittersweet beauty of these lovely old structures, with some rust, chipping paint, and failing shingles juxtaposed against the blue sky and lush greens of a summer landscape. These buildings are old and run-down. But they're still standing. 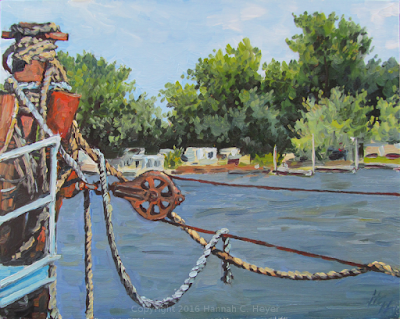 Monday night was a picnic and paint event at the Harbor Bar in Hagar City, WI. I didn't do a painting there myself, but enjoyed some good food and watching other artists work. Afterwards I headed back out with my gear to try to capture the moonrise. The Full Strawberry Moon. 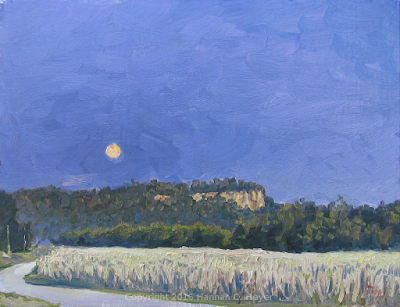 I chose a spot facing a place called Rattlesnake Bluff and a field of tall standing grain. I am not at all an experienced painter of nocturnes! If the folks in that neighborhood looked out and saw someone with an easel under a streetlight, with a cellphone for extra light, flailing around trying to avoid biting insects... well, I know who it was. 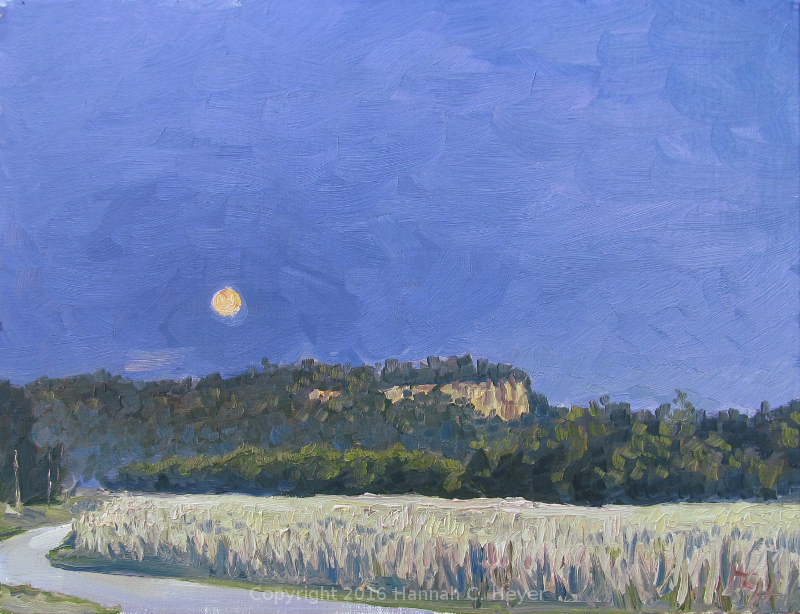 Moon Rising over Rattlesnake Bluff, 9 x 12" plein air oil on linen/hardboard. Tuesday. Time for a hike. Before the week began I treated some of my clothing with permethrin, so I could go into fields and woods with a little less worry over insect bites - especially from ticks, which have been pretty bad this year. I gathered all my gear - easel, paints, umbrella, etc. and hiked up Mt. La Grange, a.k.a. Barn Bluff. It was a hot hike, but there was a good strong breeze at the top. 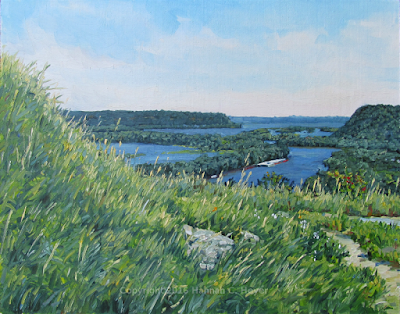 I followed the Prairie Trail all the way to the east end of the bluff, and found a nice out-of-the-way spot to paint, with a view of the river. 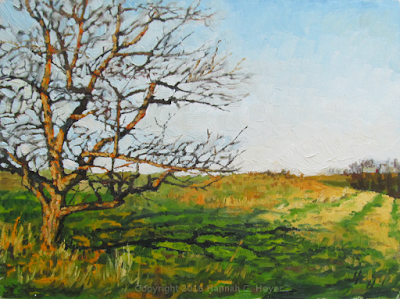 Prairie Trail View, 11 x 14 plein air oil on linen/hardboard. The evening found many of us up on the neighboring bluff-top (you can drive up this one) at Memorial Park, painting the sunset on the first day of Summer. What a gorgeous night to watch the sky. Beginning of Summer, End of the Day, 8 x 10" plein air oil on linen/hardboard. Wednesday - a day that alternated between flat, overcast skies and intense sunshine. I returned to Old Frontenac and took a walk around the neighborhood. Had to go back and visit the barn I painted last year. I found another artist working nearby, and decided to join her and paint a different view of the same place I admired so much last time. It has such a great old face, and I appreciate it all the more after struggling with the perspective of it and trying to get all the windows and doors to fit in their proper places. I'm also glad the owner hadn't gotten around to painting the old gate yet - the variations and the wood showing through gave me more color to work with. And the great old trees provided a fine backdrop. Thursday morning started out cloudy and rainy, and I was so tired that my plans of getting an early start to the day just didn't happen. I drove around for awhile, got lost, and eventually got a better feel for one area outside of town, but no painting happened. After the rain stopped, it was still a very cool day. Perfect for another hike. This time I went up the other side of Barn Bluff, following the Quarry Trail with its cliff rising up on one side and the steep hill dropping off on the other. A fallen tree caught my eye and I had a go at painting it. The mosquitoes, when I was still, sitting in one place, were terrible, and I'd forgotten my bug spray. An extra shirt wrapped around my head helped keep the humming hoards away, and I could enjoy myself. I love being in the woods. The backdrop of cliff, rock, and gravel is quite different than what I usually paint and was a good challenge, and I reveled in painting the moss that covered the root flare of the fallen tree. 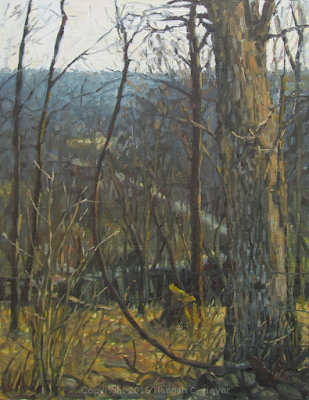 Quarry Trail Afternoon, 11 x 14" plein air oil on linen/hardboard. By the time I'd cleaned up and hiked back down the bluff, the day was far spent. I wanted to do one more painting, though, and headed back to the area I'd explored in the early part of the day. The sun was getting low - a beautiful light, but a fleeting one. 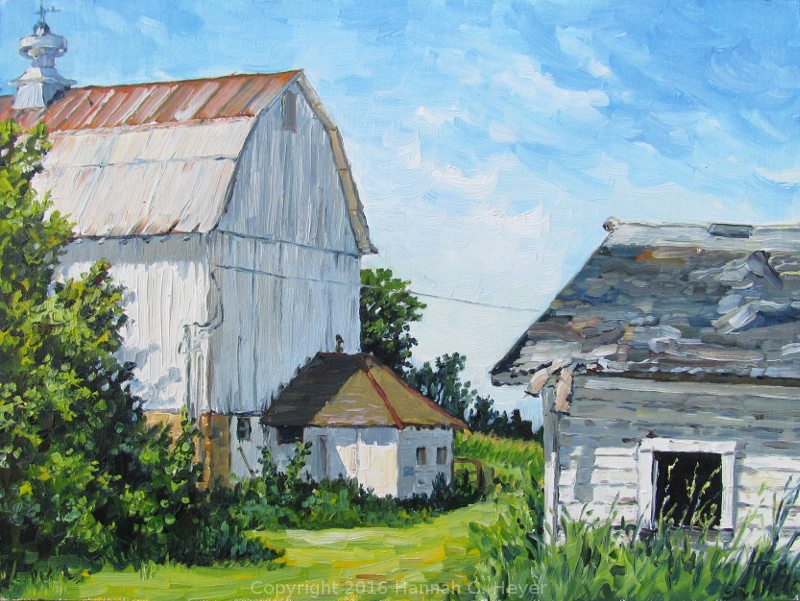 I set up near a farm, hoping to paint the cows, but also eyeing up the steeple on the horizon. 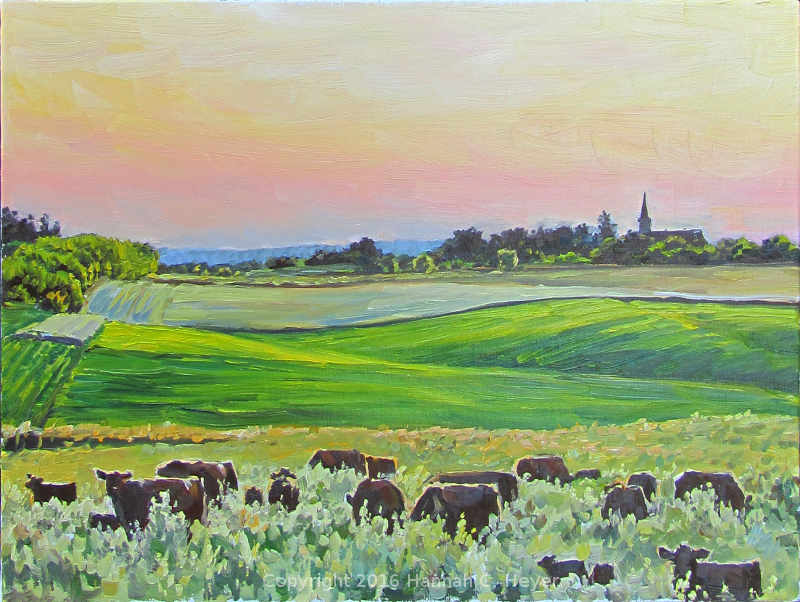 After I'd sketched in the latter, the obliging bovines slowly grazed their way right to where I wanted them and I painted them in too. 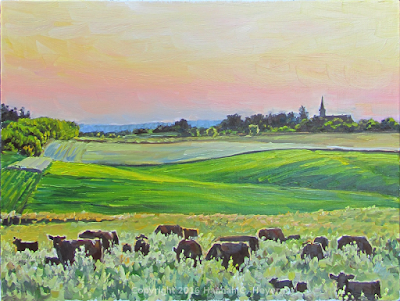 Grazing in the Thistles, 9 x 12" plein air oil on linen/hardboard. Friday was the day to pick three paintings, frame, and deliver them to the gallery to be hung. A private reception was held Friday evening, and awards were announced. 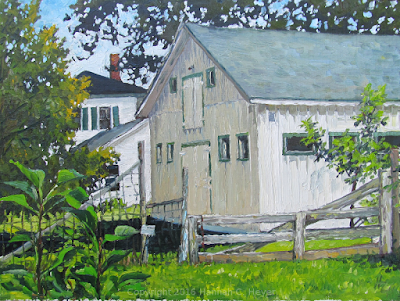 I was so happy to receive an Honorable Mention on my first painting, "Still Standing"! This year's judge was Kathie Wheeler. I was first introduced to her and her work the first year I did this event, and I've been a fan ever since. Saturday morning was the quick paint. I had picked the spot I planned to paint the night before, but the morning started out hot, with a promise of getting even hotter, and the spot I'd picked was in full sun. I changed course, and ended up painting something different than what I'd planned, and also sort of revisited something I'd painted last year. But I don't regret it. It's amazing, though, how quickly two hours go by when trying to paint a complicated mass of ropes and cables in changing light. Ropes and Pulley, 8 x 10" plein air oil on linen/hardboard. 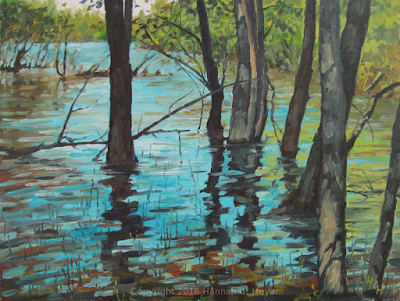 The show will be hung till late August, and can be seen at the Depot Gallery in Red Wing, Minnesota. Stop by and see the whole show! I have the window open right now, and can hear that sweet sound of spring frogs singing in the stillness. It was a warm and windy day. I got to go on a long walk with my little niece to jump on round bales, check out the trees budding in the orchard, walk through the hay fields looking for birds and looking down gopher holes, and finding the cows. It was a good day. Here's a little catch-up of some of the paintings I've done over the past month or two, as we've been transitioning from winter into spring. February 26th. Returned to one of my favorite places to paint the snow, what was left of it, between the trunks of the great old trees that stand on the hillside. The shadows were long and blue, the sunshine warm. 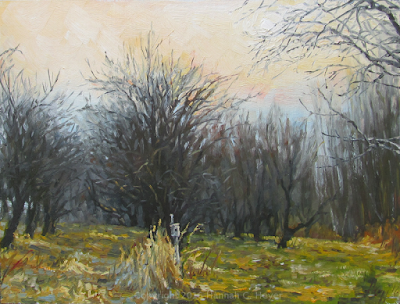 I painted quickly, trying to capture the light before it disappeared. 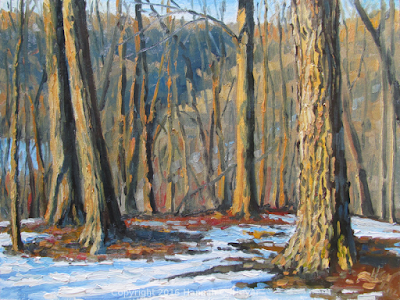 February Among the Trees, 9 x 12" plein air oil on linen/hardboard. March 11th. 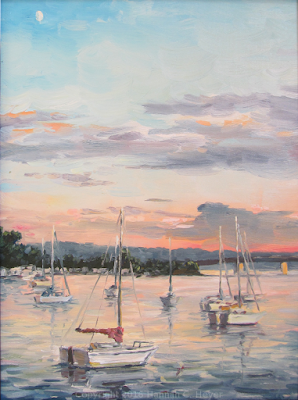 Another sprint of a painting - working hard and fast as the wind blew and the sun sank in the west. The bare fields were golden in the evening light, full of texture and subtlety that I couldn't do justice to in the time I had, but which I tried to hint at. This spot has a great view through the neighboring bluffs in the background that always draws my attention. As the wind died down at sunset, the sound of geese rang out as they flew overhead on their way north. 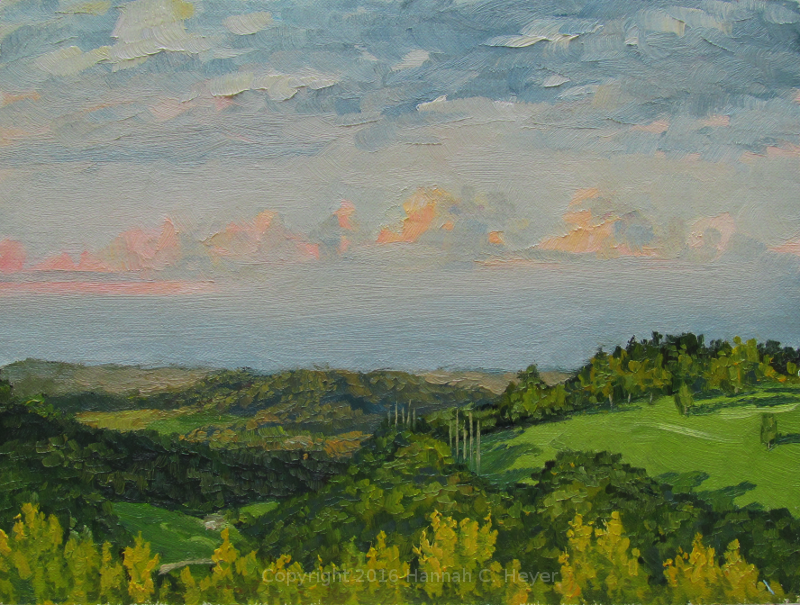 Evening Impression, 9 x 12" plein air oil on linen/hardboard. March 12th. Orchard time. My little sis worked on her pruning skills, while I worked in paint. Different types of brushwork. It was a hazy sort of day, and I wanted to convey those soft greys and purples I saw in the rows of trees and thick masses of branches and twigs. A birdhouse stood at the end of one row in a clump of dry grasses. The Birdhouse in the Orchard, 9 x 12" plein air oil on linen/hardboard. March 22nd. A portrait of a tree, its rough bark and the old barbed wire fence that's it's grown right over. A grape vine loops its way into the upper branches. The valley stretches out below. The light was soft through a thin layer of clouds. I painted until sunset. View from The Point, 12 x 9" plein air oil on linen/hardboard. March 28th. Another paint and prune day. The sun shone in a clear sky and the shadows were strong and dark. The grass was beginning to grow green on the south-facing slopes. My eye was really drawn to the intricate tangle of twigs against the sky, but I wasn't sure how to best give that impression while working wet into wet oil paint. I tried one way and another. This was the result. Smudged and thick with texture. Spring-time Shadows, 9 x 12" oil on linen/hardboard. April 16th. We've had snow since the last painting, but it has long gone, and the pastures are dry and green enough for the cows to have a snack, if not a feast. Painting living, moving creatures is still a huge challenge for me! The trees are budding and beginning to show some color, and the fields are beginning to show more green than brown. Basking in the Sunshine, 9 x 12" plein air oil on linen/hardboard.